This modern lighting masterpiece features three free-flotaing arms on an aerial cable. Each arm is tipped on both ends with frosted lamps and white flight paper. 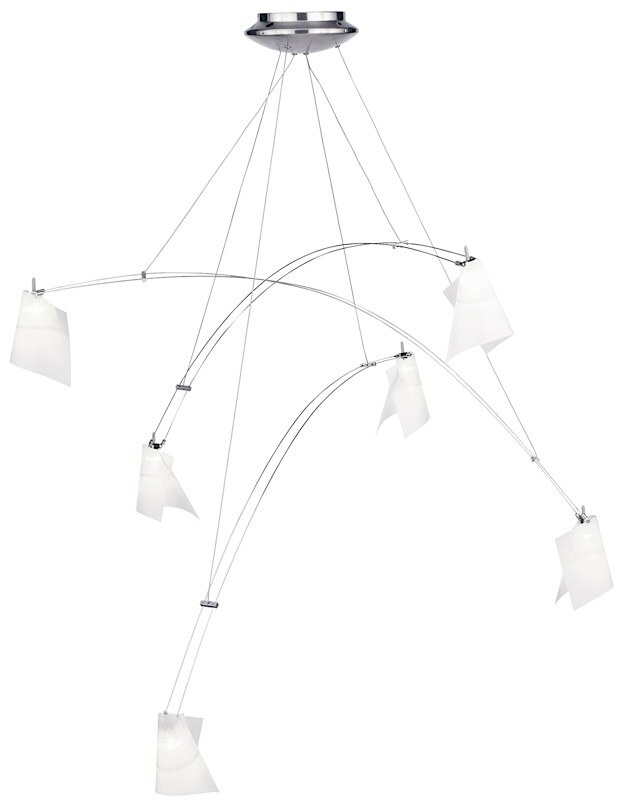 Resembling a wonderous mobile, the Mini Crescendo Chandelier will add a fanciful look to your home. A 6.5" diameter round canopy houses a 150 watt transformer with short circuit protection. Includes six 12 volt, 20 watt Frostline MR16 lamps. Dimmable with low- voltage electronic dimmer. This product can mount to either a 4" square electrical box with round plaster ring or an octagonal electrical box (not included). Fixture recommended for installation in locations with minimal variances in airflow.